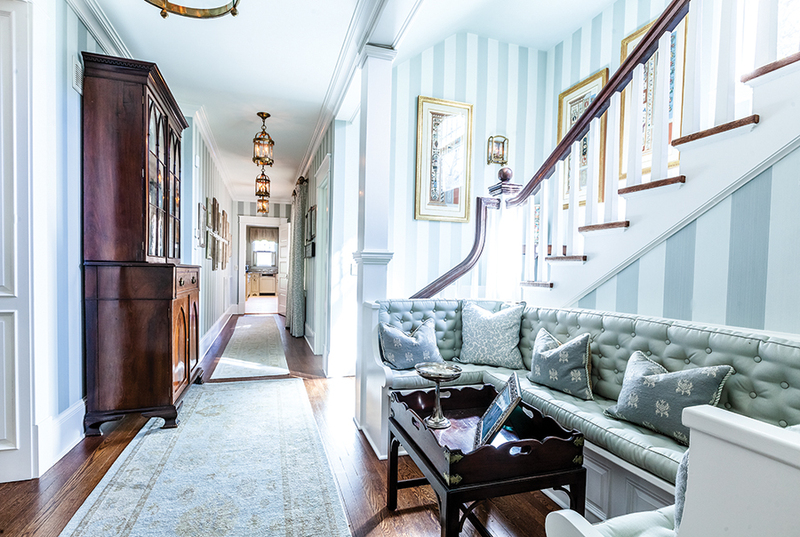 The adjective pool runs dry just inside the front door of Fownes Cottage, which, at 7,000-plus square feet on a triple lot, has been a Pinehurst village landmark since 1914. At first, the exclamation is one of surprise, since the house presents an optical conundrum. Streetside, the windswept cedar shingles on the longitudinal frontage suggests the New England coast. Then, past a low brick wall, brilliant green manicured winter grass, shrubs and patio suggest more. 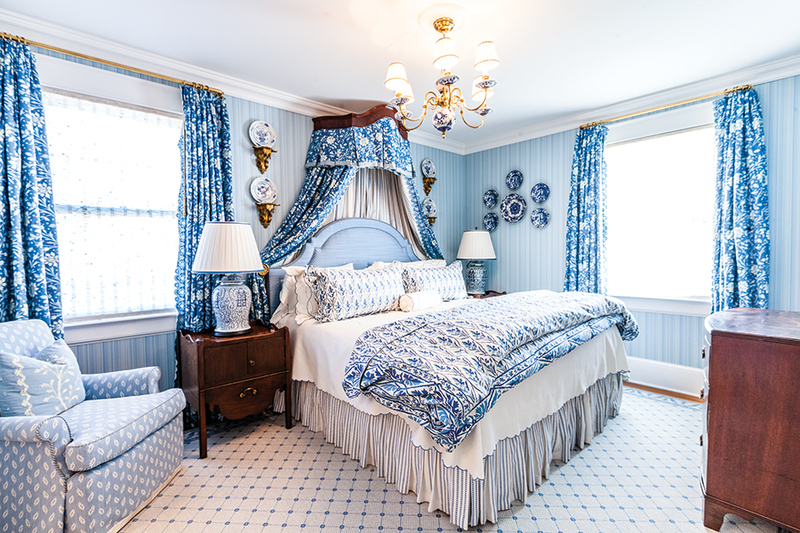 Yet not even that hint prepares the visitor for a first look: comfortable formality expressed in misty turquoise, cloudy white, and blue shading from Wedgwood to royal and bright navy. 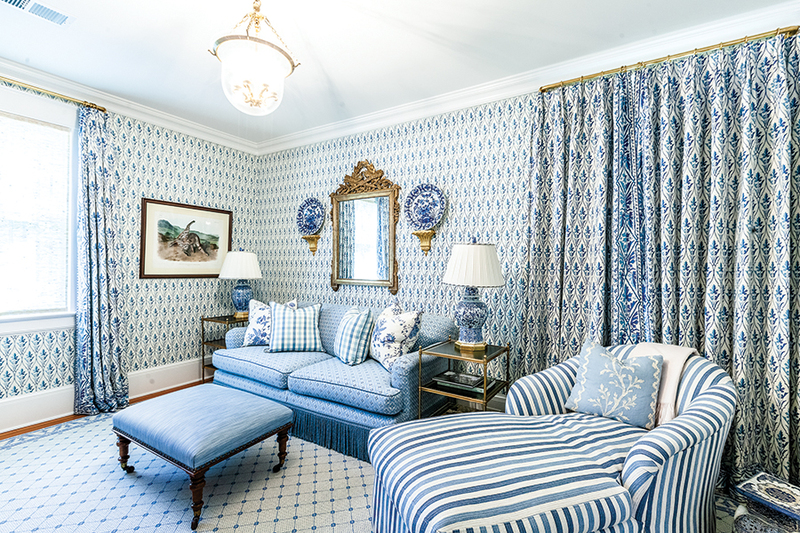 Blue, blue, blue, chosen for its soothing qualities, repeated in custom carpets, luxurious drapes and floral upholstery . . . Stand in the foyer, face the staircase and turn clockwise. The most unusual greeting area has a low table and tufted banquettes. Next, a living room that stretches a mile to the family-gaming-sun room with bar; a dining salon seating 12 with elbow room aplenty. Stop there to admire the wallpaper — a diorama of greenish blue foliage and oversized birds, from the historic Gracie Chinoiserie collection. 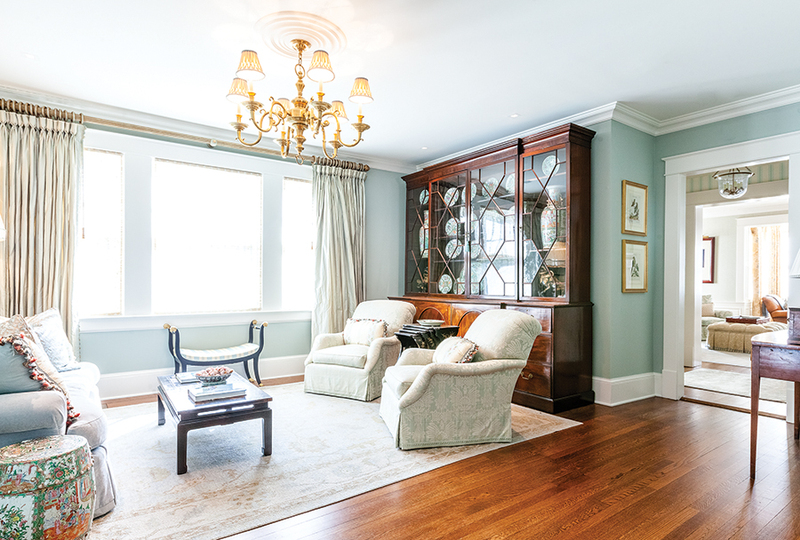 This space earns the kind of massive chandelier often seen crammed into smaller rooms. Floorboards, some original, are stained and polished strips of pine and oak. 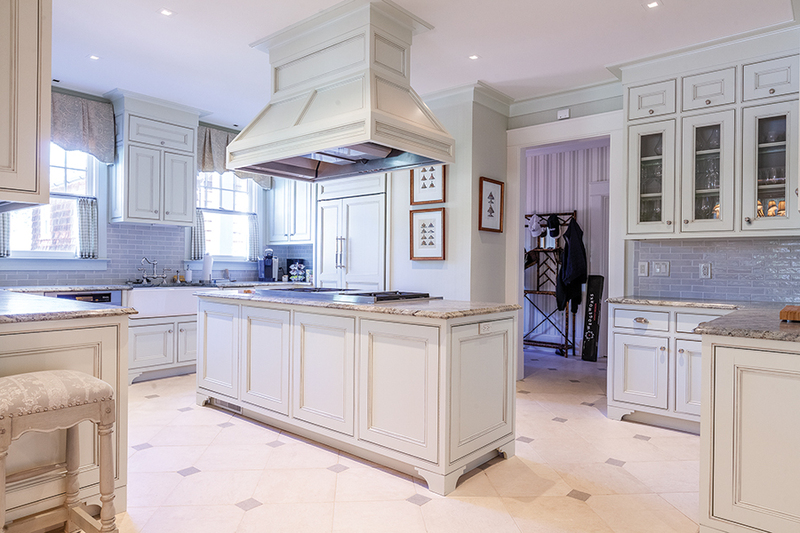 The kitchen seems odd at first, well equipped but smallish — at least the part glimpsed from the dining room. However, behind closed doors are a preparation area and butler’s pantry used by the resort chefs who prepare fine cuisine for guests and business meetings. 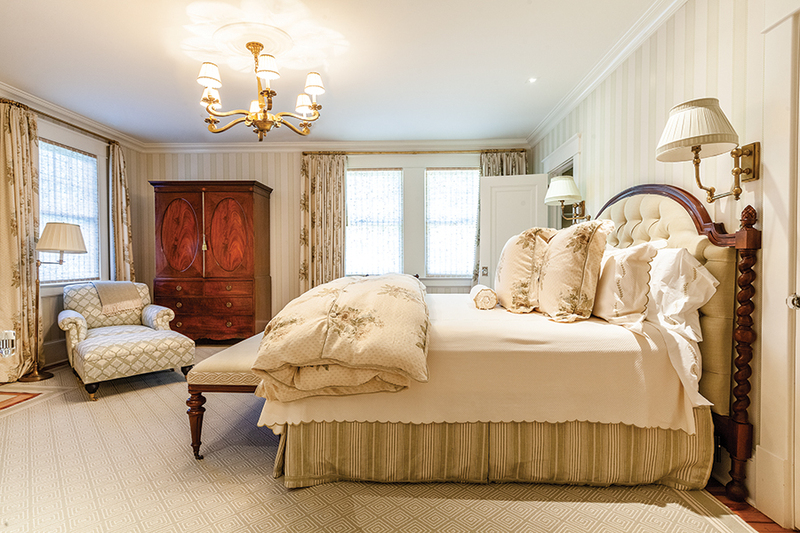 Fownes Cottage is both a satellite home for the family of Bob Dedman Jr., owner of Pinehurst Resort, and lodging for his guests. Golf memorabilia is everywhere, yet integrated into the formal décor. Dedman’s favorite example lines an upstairs hallway: framed pastels of the 18 holes on No. 2 by noted artist Jane E. Hixon, a Pinehurst resident. Elsewhere, trophies, photos, autographs, a scorecard signed by Donald Ross — even a battered golf bag belonging to Fownes himself. Less formal, the attic has been transformed into a girly dorm with berth beds for the teenage Dedman daughters. In truth, like a cream-filled French pastry, its richness is better appreciated in small bites, interspersed with history. By 1914 word of Pinehurst had reached the right ears. What started as a health resort was becoming a wealth resort, thanks to the golf links James Walker Tufts provided for exercise. Rich merchants, bankers and industrialists from Pennsylvania and points north recognized its attributes (climate, rail transportation, accommodations) as a winter destination. The homes Tufts built for long-term guests were soon joined by larger “cottages,” a misnomer unless the occupant’s primary residence is Versailles. During Prohibition, alcoholic beverages were rumored to be available. But for Henry Clay Fownes of Pittsburgh, golf was the main event. Heaven knows, he could afford it. Fownes became a hands-on homeowner. Despite his wealth, in 1926 he wrote a letter complaining about a plumbing bill for valves, and a water bill for keeping the garden alive during summer months when the house was unoccupied. Fownes’ previous project, in 1903, was developing and presiding over the world-famous Oakmont Country Club in Pittsburgh, designated as a National Historic Landmark. 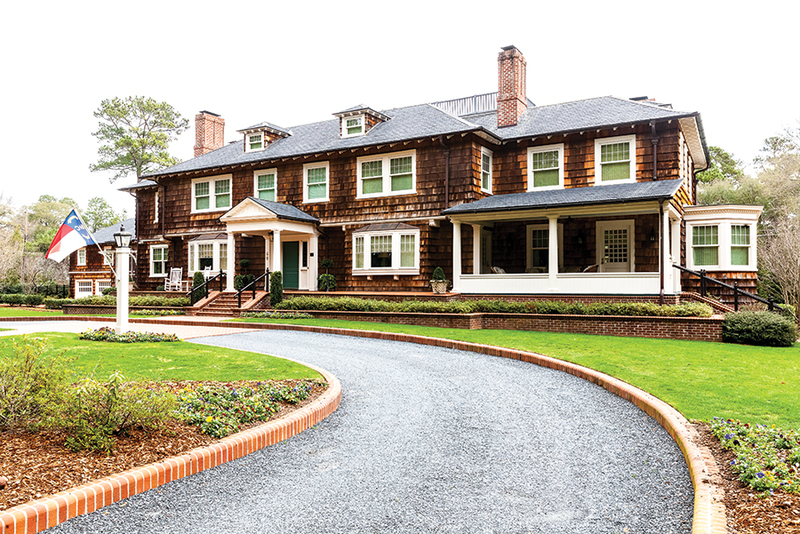 Its longitudinal shingled clubhouse foreshadows his Pinehurst retreat. H.C. and wife Mary had one child, William, (named for H.C.’s brother), who kept the house after his father’s death in 1935. Parts of the interior were destroyed by fire in the late 1920s. The Dedmans are only the third owners. The Dedman family of Dallas is also legendary in the world of golf resorts (ClubCorp), philanthropy, education and other endeavors. As owner of Pinehurst Resort, with the 2014 U.S. Open Championship approaching, Dedman wanted a residence here. “It was the opportunity to have a historic house and a sense of place to entertain in a more intimate setting,” he says. “I looked at land at No. 8 but wanted something closer to the campus, where I could walk to the village and get a coffee at The Roast Office.” He decided on Fownes Cottage in 2013, which meant only a year to renovate. 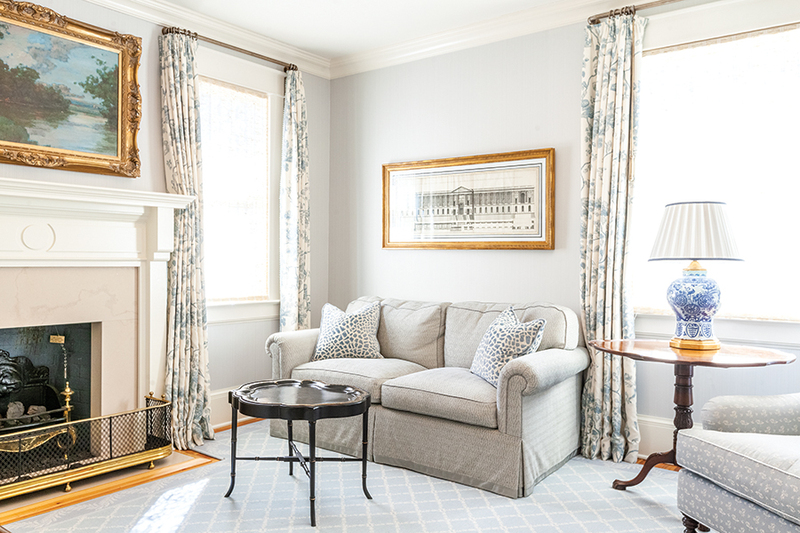 “We wanted a gracious, historical house, more like a home than a hotel,” furnished in antiques, but with every bell, every whistle, every fireplace and background music selection controlled remotely. 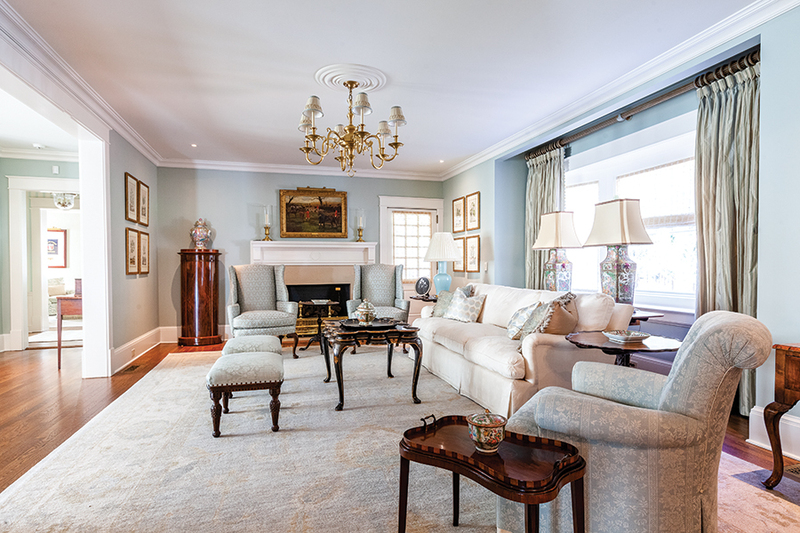 This meant rearranging seven bedrooms into four suites (and an office), each with a bathroom and sitting area, creating the attic dorm and adding niceties like an upstairs coffee kitchenette with paneled refrigerator, as well as replacing all the systems and enhancing the landscaping — a huge undertaking. 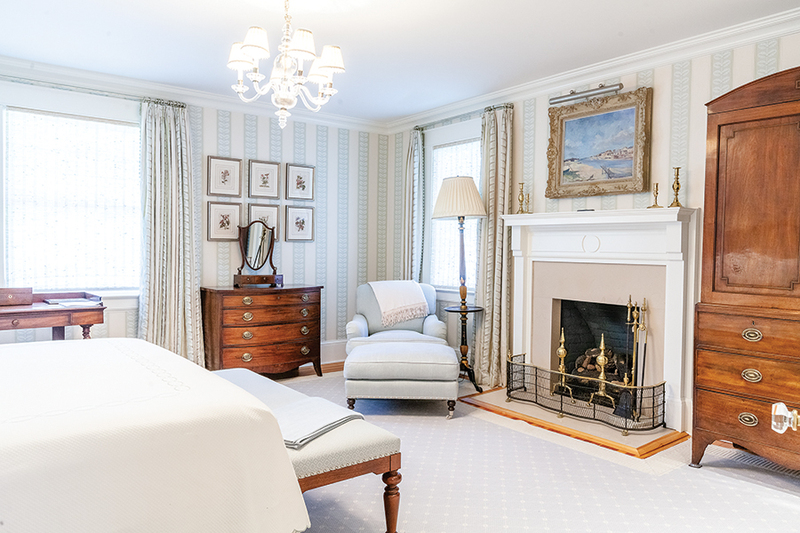 Most visible, therefore of prime importance, were furnishings and décor implemented by Dallas interior designer Mark Clay, fresh off 20 years with Ralph Lauren in New York. 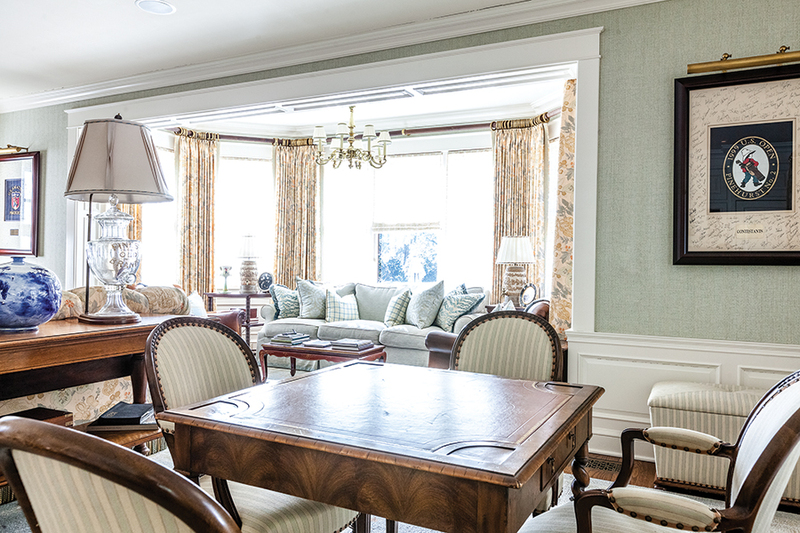 Clay had designed interiors for Dedman family homes in Vail and the Virginia mountains, as well as their new home in Dallas. “I know what they love,” he says. This time, Clay translated that love into an English manor rooted in local history. 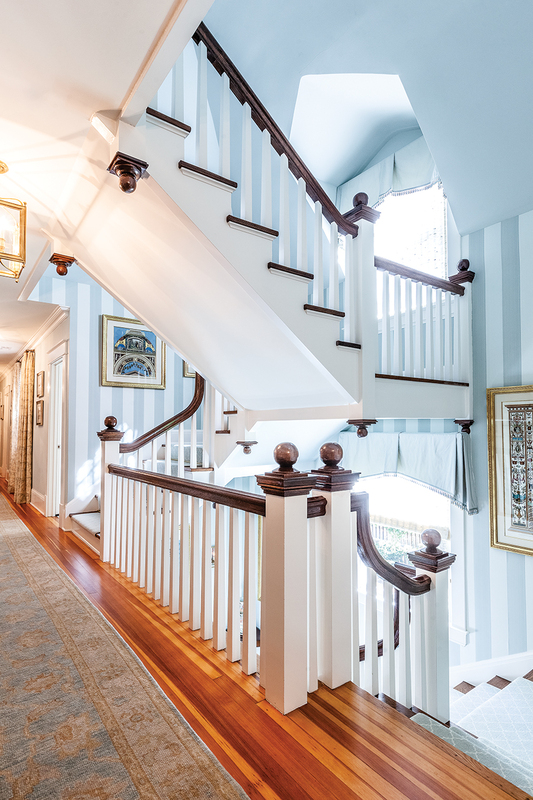 “It was important to Mr. Dedman that the house show respect for Pinehurst.” At Dedman’s suggestion he scoured Moore County for photographs and magazine covers to surround with silvery frames, which complemented the pervading blue. Clay commissioned rugs in particular hues and patterns, including a wide 55-foot hallway runner, which were woven to order in Turkey. Seagrove pottery in a rainbow of blues was also created for the cottage. “Mr. 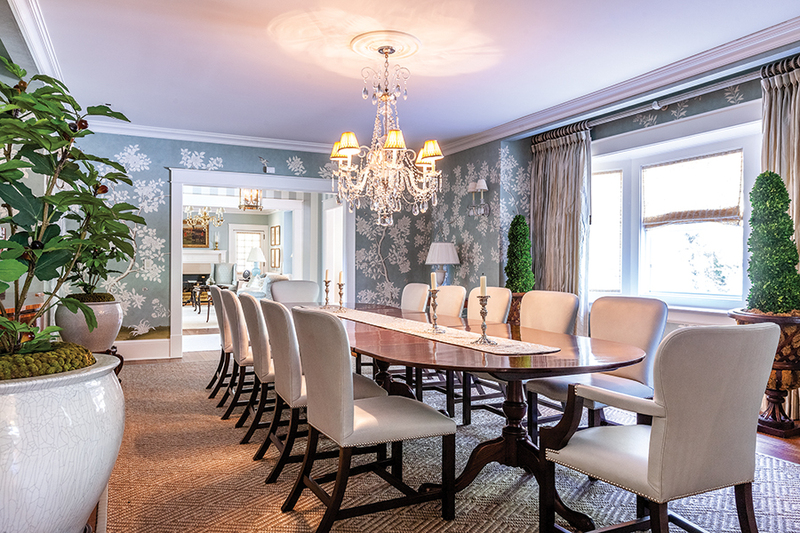 Dedman bought the dining room table,” but the antique Waterford crystal chandelier over it came from the couple’s first house, “something of sentimental value,” Clay adds. 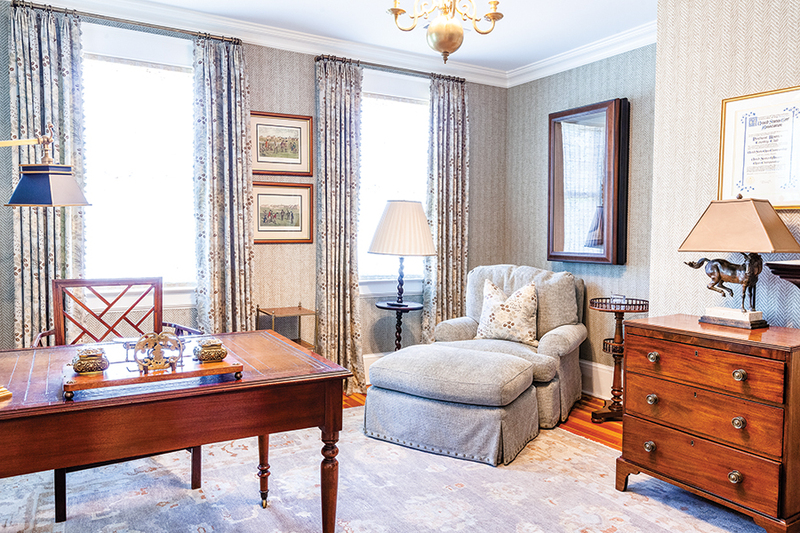 Instead of hiding TVs in armoires, Clay found less massive antique linen press cupboards to retrofit, since the bedrooms, including the master suite, are moderately sized. Other case pieces, all in mahogany and dark woods, were shipped from the Dedman estate in Dallas or sourced in Raleigh. Details complete this portrait of style and elegance. Since some doors already had glass knobs, Clay replaced others with cut crystal — smooth and heavy to the touch. Windows throughout are covered with shades fashioned from natural grass that, while admitting light, provide privacy without drawing the heavy drapes. Clay was instructed to furnish the above-garage apartment with pieces of equal mode and quality as the cottage, lest overflow guests feel slighted. In the meantime, Fownes joins Mystic Cottage (village home of Fownes’ friend Leonard Tufts, built in 1899), Dornoch Cottage (built by Donald Ross in 1924) and half a dozen others representing an era when golf, and Pinehurst, were attracting, in James Walker Tufts’ words, “A refined and intelligent class of people.” People with the interest and means to build, and now renew these homes.